Ever wish there was a simple way to earn your college degree more affordably? There is. You can take online college courses that earn you real college credit, are guaranteed to fit in to your degree program, and can be completed at your own pace. How to find online courses that can earn you college credit. Most online courses are not credit-bearing You’ll find online courses that can earn you college transfer credit are typically reviewed and recommended by the American Council of Education (ACE) credit recommendation service. For example, all 60+ online courses available through StraighterLine (an online course provider that focuses on general education credits intended for transfer to other schools) have been reviewed and recommended by ACE., Not every provider and course is ACE recommended, so it’s important to identify your personal needs and goals before enrolling in any online course. How to find high-quality online courses that are extremely low-cost. One of the major financial mistakes students make is taking online courses through traditional college channels where online courses can cost just as much as those taken on-campus, and in some cases, even more. Online college course providers outside of the traditional education model, on the other hand, offer the same classes, but can do so at a much lower price. One of the growing trends in higher education today is self-paced, tutor-supported courses at extremely affordable prices, such as what StraighterLine provides. They provide inexpensive courses with a flat $99 per month subscription, so you can progress as quickly or as slowly as you want. Subscription based pricing is extremely affordable. It allows you to move through class material at your own pace. If you are an extremely motivated student, you can move very quickly and keep your overall cost exceptionally low. If you want to take more time, you can, but you have a financial incentive to complete your classes. A subscription is very low risk for students. If life gets in the way, you can pause your subscription at any time, and restart when time permits. 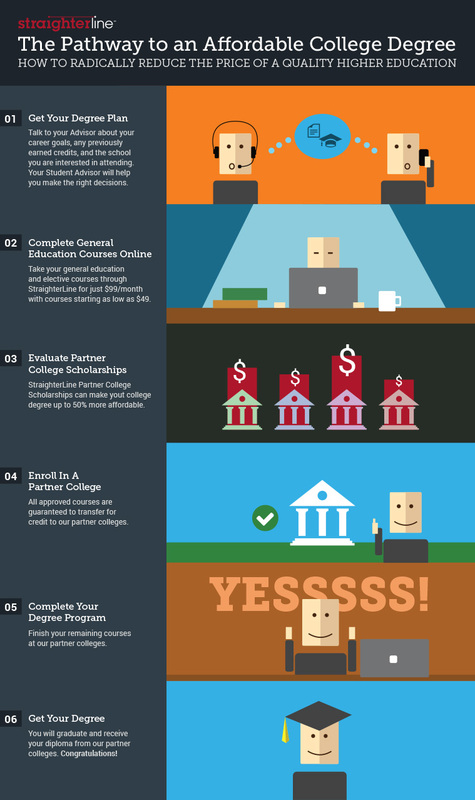 How to maximize the value of online college courses in getting your degree. To determine which online courses will fit into your degree program, get a personalized degree plan from a Student Advisor at your preferred online college course provider. Your Student Advisor will ask you about any previously earned college credits and the degree program, including competency-based education providers, you are interested in attending. General education courses (GenEds) – the ones that everybody takes their first and second years in school – are extensively transferred among colleges, and they don’t tend to vary too much from one school to another. In other words, where you take your GenEds doesn’t really matter. The general education core, about 40-60 course titles, represents a third of all course enrollments in higher ed. Taking these courses online though low-cost online college course providers can save you significant money on your degree. You can save a significant amount of money on your degree by taking your general education courses online and then transferring them to your preferred college or university. Many scholarships are out there that you may not even be aware exist. Students completing online college courses through StraighterLine, for example, can take advantage of Partner College Scholarships which can help make a college degree up to 50% more affordable. Leading online college course providers have a network of partner colleges and universities, including non-profits and those that are career-focused. Your approved course(s), as mapped out within your degree plan, are guaranteed to transfer to those partner schools. Additionally, you can transfer your approved ACE Credit recommended courses to over 2,000 colleges and universities that are part of the ACE Credit College and University Network. Be sure to check with your college for verification of credit transferability. Finish your remaining courses at the partner college. You will graduate and get your diploma from the partner college. It’s the same diploma that everyone else gets from the school – it’s no different just because you transferred in some GenEd credits. College can be more affordable. By integrating online college courses as part of your plan and taking advantage of scholarships, students can earn the same degree as other graduating students – but pay thousands of dollars less. This post was provided by Beth Dumbauld from StraighterLine. BIO: Beth Dumbauld understands that earning a college degree as an adult changes lives. She writes about topics intended to encourage, support, and help adult learners make the best choices around their decision to go back to school. She is currently the content manager for StraighterLine. Westface College Planning can help navigate the financial aid process from start to finish, including whether or not you should consider online courses. To learn how we can help you call us at 650-587-1559 or sign up for one of our Tackling the Runaway Costs of College Workshops or Webinars.